94 year old grandfather-of-two Percy Nash, of Hardy Road, Bishop's Cleeve, contacted us in September and shared his own memories. 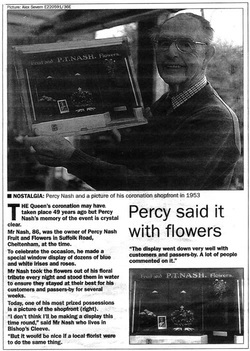 Percy was the owner of Percy Nash Fruit and Flowers at number 24 Suffolk Road (now Q&C Militaria). At the outbreak of the first world war Percy volunteered to join the Royal Navy for a 12 year period of service, but was invalided out with pleurisy and spent some time in hospital. When he recovered he was given the opportunity to join a destroyer but this was then sunk and he ended up joining a submarine training base on The Isle of Mull in the Western Isles instead. Unfortunately he again went down with pleurisy and ended up in a local hotel that was being used as a temporary hospital. He was discharged just before Christmas and was told to report to Standish hospital near Stroud on the 7th of January (which was his birthday) only to be told that he had tuberculosis! That meant leaving the navy and after 6 months convalescence he took as job as a market gardener in order to benefit from the fresh air. He was working near Evesham when he met his wife Hortense (she worked in the post office at North Harrow) and they married in St Albans. 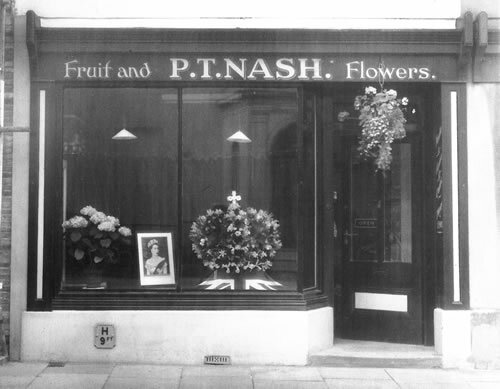 In 1950 they found the Suffolk Road premises, which was lying empty, and they set up Percy Nash Fruit and Flowers. 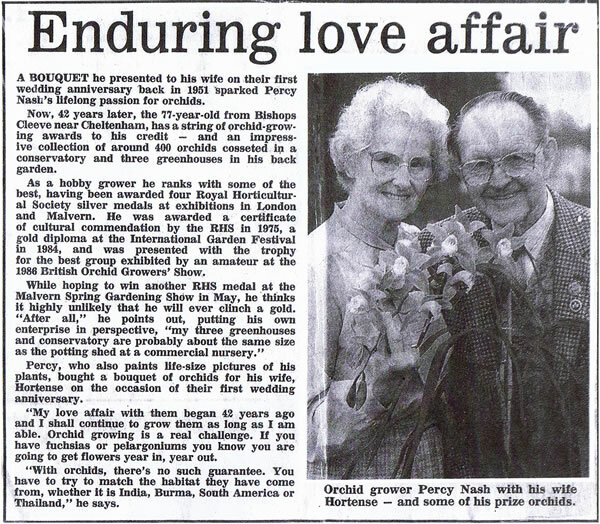 In 1951 Percy gave Hortense a bouquet of orchids to celebrate their first wedding anniversary and that started a life-long passion for the flower resulting in Percy gaining a string of orchid-growing awards and a personal collection of about 400 varieties. They used to buy their orchids from Cyphers nursery in Queens Road near the railway station that specialised in the flowers and exhibited at the RHS, even importing special soil from America to help guarantee their success. In 1953 Queen Elizabeth had her coronation and they celebrated with the window display seen in this photograph which is one of Percy’s most prized possessions. In 1956 they sold the business and built a bungalow on a plot of land in Winchcombe where they carried on market gardening. Percy suffered from ill health again, however, and eventually had to give up the majority of his outside activities. They did, however, buy a field of sprouts that they used to then sell at Cheltenham market! In his spare time Percy became an accomplished artist and continued his passion for painting and growing orchids. Sadly Hortense died aged 90 on the 9th of January this year at the Sue Ryder Hospice and we were delighted to be given a photograph of the couple to celebrate such a true and enduring love story.